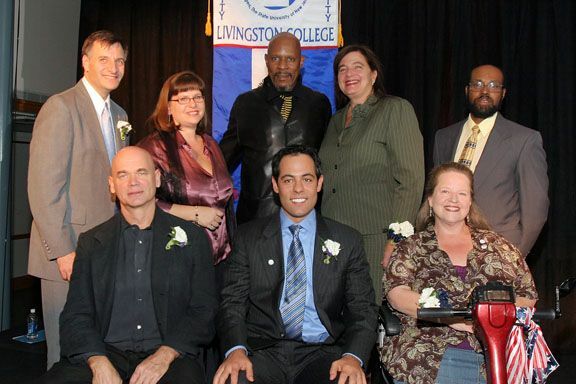 Approximately every two years, the Livingston Alumni Association (LAA) presents the Livingston College Distinguished Alumni Awards and Livingston Legacy Award (for faculty and staff). The most recent awards celebration was held Tuesday, March 20, 2018. 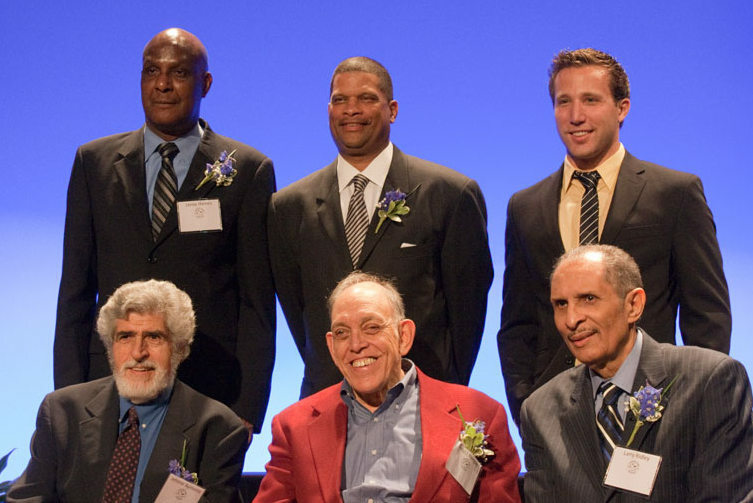 See the award descriptions and bios for all of the distinguished alumni. LAA's first Distinguished Alumni Awards were presented at a brunch on Saturday, September 9, 2000, honoring: Riki Jacobs, LC'80; Clifton R. Lacy, LC'75; John S. Lipori, LC'77; and Alfred E. Ramey, Jr., LC'73. Source: Livingston College newsletter, Winter 2002 (page 7). Photo: From left, Distinguished Alumni John S. Lipori, Clifton R. Lacy, Riki Jacobs and Alfred E. Ramey, Jr. The 2002 awards were presented Saturday, October 12 at a luncheon in the Livingston Student Center. The four Distinguished Alumni were: Thomas F. Daley, LC'75; Susan Kille, LC'74; David A. Laskow, LC'77; and Steven D. Plofker, LC'78. Source: Livingston College newsletter, Winter 2003 (page 4). Photo: From left, Distinguished Alumni Steven D. Plofker, David A. Laskow, Susan Kille and Thomas F. Daley. The 2004 awards were presented Saturday, November 6 at the Livingston Student Center. 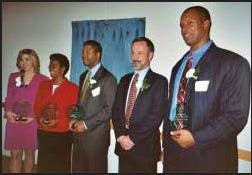 The honorees were Frank T. Carvill, LC’75, posthumous; Gina Collins Cummings, LC’84; Edward E. Johnson, Jr., LC’79; Michael C. Laracy, LC’74; and Harry V. Swayne III, LC’90. The Livingston Alumni Association also presented the first Seth Dvorin Distinguished Young Alumni Award, named after Lt. Seth Dvorin, a 2002 graduate of Livingston who was killed in February in the Iraq conflict while attempting to defuse a roadside bomb. Karen Rogers Lee, LC’92, an honors graduate of Livingston College and a news reporter with 6ABC Action News in Philadelphia, was the first recipient of this award. Source: Livingston Alumni News, Winter/Spring 2005 (page 1). Photo: From left, Karen Rogers Lee, named as the Seth Dvorin Distinguished Young Alumna; and Distinguished Alumni Gina Collins Cummings, Edward E. Johnson, Jr., Michael C. Laracy and Harry V. Swayne III. The 2006 awards were presented Saturday, October 14, at the Livingston Student Center. The Distinguished Alumni recipients were Avery Brooks, LC’73; Colleen Fraser, LC’74, posthumous; Mark Helias, LC’74; Liza Kirschenbaum, LC’87; and Andrea D. Lyon, LC'73. The Seth Dvorin Distinguished Young Alumni Award was presented to Gregg Spiridellis, LC'93. Photo: Front, from left, Distinguished Alumnus Mark Helias; Gregg Spiridellis, Seth Dvorin Distinguished Young Alumnus; and Christine Fraser, who accepted the Distinguished Alumna Award on behalf of her sister, the late Colleen Fraser. Rear, from left, Marty Siederer, LAA President; Distinguished Alumni Liza Kirschenbaum, Avery Brooks and Andrea D. Lyon; and Livingston College Dean Arnold G. Hyndman. See the photo album, courtesy of Steve Goodman. The 2009 awards were presented on Saturday, May 15, at the Douglass Campus Center. The Distinguished Alumni recipients were Marla Diamond, LC'92; Francoise Jacobsohn, LC'78; and Martha Nell Smith, LC'85. Kevin Apuzzio (LC'06) posthumously was honored with the Seth Dvorin Distinguished Young Alumni Award. The recipients of the first Livingston Legacy Awards were Professors Maria Canino, Edward Ortiz and Gordon Schochet. Photo: Front, from left, Livingston Legacy honorees Edward Ortiz, Maria Canino and Gordon Schochet. Rear, from left, Livingston College Dean Arnold G. Hyndman; Distinguished Alumnae Franciose Jacobsohn, Martha Nell Smith and Marla Diamond; Joseph Apuzzio, father of the late Kevin Apuzzio, who had been honored as a Seth Dvorin Distinguished Young Alumnus; Leila Apuzzio, sister of Kevin Apuzzio; and Marty Siederer, LAA President. See the photo album, courtesy of Matt Kleinschmidt. Watch the video tributes to the honorees. Photo: (Front) Livingston Legacy honorees Jerome Aumente, Gerald Pomper and Larry Ridley. (Rear) Livingston Legacy honoree Leroy Haines; Distinguished Alumnus Eddie Jordan; and Matthew Cortland, winner of the Riki Jacobs Livingston Pride Award. See the photo album, courtesy of Rebecca Berkowitz. The 2013 awards were presented Wednesday, October 9, at the Rutgers Club. LAA honored three distinguished alumni: Ndidi N. Amutah, LC'03; Nicholas Ferroni, LC'03; and Jessie J. Hanna, LC'07. The Livingston Legacy Award went to Roger Cohen, a professor emeritus of Livingston's and Rutgers' journalism program. Photo, from left: Distinguished Alumni Jessie Hanna, Ndidi Amutah and Nicholas Ferroni. See the photo album, courtesy of George Jones. The 2015 awards were presented Tuesday, November 10, at the Rutgers Club, to Distinguished Alumni Robert P. Bertrand, LC'01; Kenneth B. Cop, LC'95; and Deborah L. Stokes, LC'74. LAA also posthumously honored Wilson Carey McWilliams with the Livingston Legacy Award. McWilliams was a distinguished political science professor at Livingston College and a prolific author who died in 2005. Photo: Distinguished Alumni Robert Bertrand (left), Deborah Stokes (second left), and Kenneth Cop (right). Nancy Riley McWilliams (second right) accepted the Livingston Legacy Award on behalf of her spouse, the late political science professor Wilson Carey McWilliams. See the photo album, courtesy of George Jones and Jeffrey Armus.